– Defining the pay element like Basic, HRA, DA etc. – Calculation of the provident fund, professional tax. Schools also has major work on the payroll system, they manage their payroll with the help of excel & also need to get the biometric machine monthly attendance data & calculating with the excel so this process is very tedious & time-consuming as they need to manage the earning and deduction and also it varies employee wise. Vidyalaya biometric attendance system provides the easy payroll integration with the biometrics. How Vidyalaya Payroll works with the biometric attendance system. Vidyalaya biometric attendance system has biometric and payroll integrated for easy use of the system & reduce the manual calculation workload. With bio-metric integration, you can get the day wise attendance through the machine also system will manage the week off and holiday automatically so at the end of the month school can get the exact total present days of the employee. The leave management through the mobile app is also possible employee can add their leave also & the management can Approve/reject the leave from the mobile app. Now coming to the Payroll in Vidyalaya biometric attendance system, it allows to add the various Earning and deduction element as per the school requirements. Once the setting is done you can calculate the allowances & their deductions either on the percentage basis or on a fixed amount. Every month by doing some simple steps payroll will be generated automatically & error free. Vidyalaya biometric attendance system allows the employee to download their pay slip directly easily & whenever they want. Different reports in payroll is helpful in the audit purpose to verify the payment details easily. 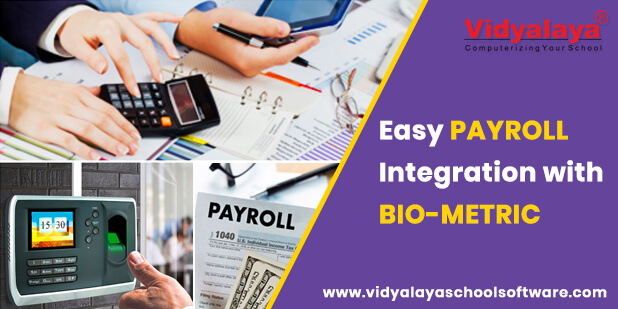 That’s how with the biometric integration your payroll calculation will be effortless & precise with the Vidyalaya biometric attendance system every month.